Last week, my little kitchen in Charlotte, NC took a trip to the Andean countries of Peru, Bolivia and Ecuador. Aji amarillo, aceite de achiote, yuca, potatoes, and beef heart (yes, seriously) were just some of the ingredients I used to test recipes for a class I’m teaching this June at John C. Campbell Folk School in Brasstown, NC. The class, which will last a week, is a survey culinary course of South American cooking and after months of research, drooling over recipes, and innumerable adjustments to my course outline, I’m now deep into recipe-testing. Cooking, jotting down notes on an achiote-stained pad of paper, and tasting, tasting, tasting are contributing to an expanding course packet and waistline. It never ceases to amaze me how one bite can store so much history and culture and selecting which recipes to include in this weeklong course, when there is enough fodder to keep even the most productive cook busy for years, has been my biggest challenge. Some of the recipes we will be preparing in June are favorites of mine from the almost 16 months I spent traveling and living in South America between 2001 and 2004. Others, like this show-stopping Causa, a traditional and very popular Peruvian dish, are new to me. On Thursday evening, as my husband and I sat down to a table packed with brightly colored dishes from a week’s worth of Andean cooking, I commented on how cooking food from a different culture is a great way to keep an open-minded palate. So often I find myself limiting my cooking and gustatory experiences to those flavors that are most common in my daily life. My nose crinkles (and may turn up a little) when I think about making a quail pie with a lemony egg mixture and sprinkling on cinnamon and powdered sugar for a Moroccan main course (it’s delicious, by the way). 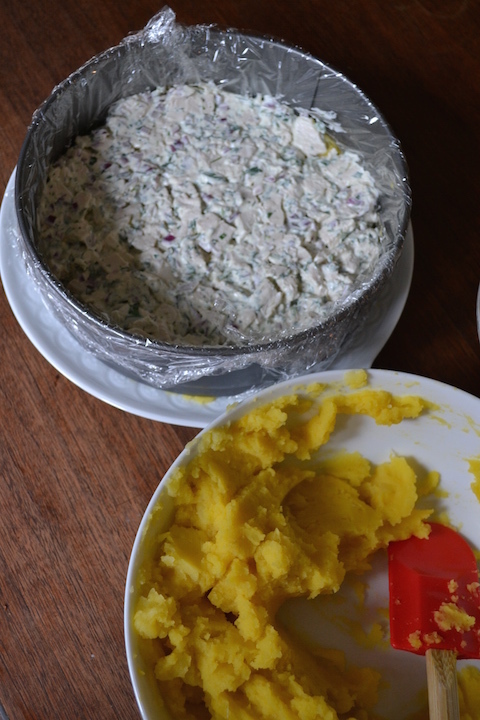 Or, in the case of South American cooking, mixing lime juice and hot yellow pepper paste with mashed Yukon gold potatoes and topping it all off with a chicken salad. But mixing lime juice and hot yellow pepper paste with Yukon gold potatoes is exactly what I did to make this Peruvian Causa. Then I added chicken salad and topped it all off with olives, hard-boiled eggs, roasted red peppers and avocados. Was I skeptical? Yes, very. Yet several bites later, I found the flavors irresistible and the recipe one of my favorites from the week. I have a feeling you’ll feel the same way. Note: When cooking hard-boiled eggs, try not to forget about them like I did. 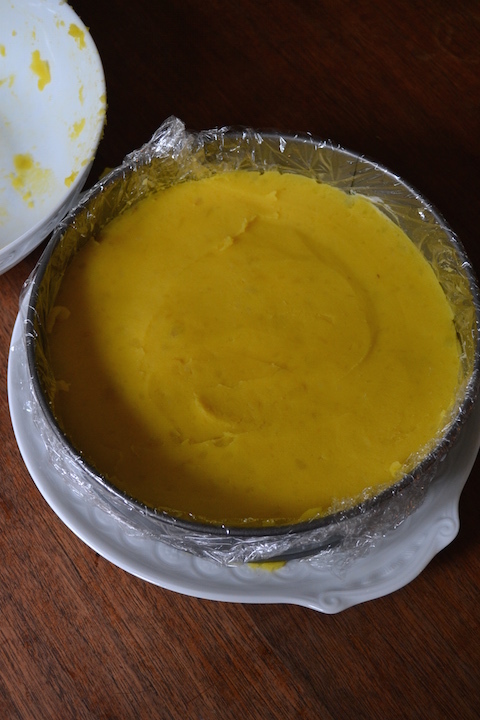 The light grey tinge around the yolk that you see in the pictures of the finished causa is the result of over-cooking. The dish would have been even prettier had I paid better attention! Causas, in their most rustic form, go back to pre-Colombian times. The decorative look of causas today can be attributed to the Spanish who introduced different fillings (crab, tuna or shrimp can be substituted for the chicken in the filling) and garnishes like the eggs, olives, and roasted red peppers. 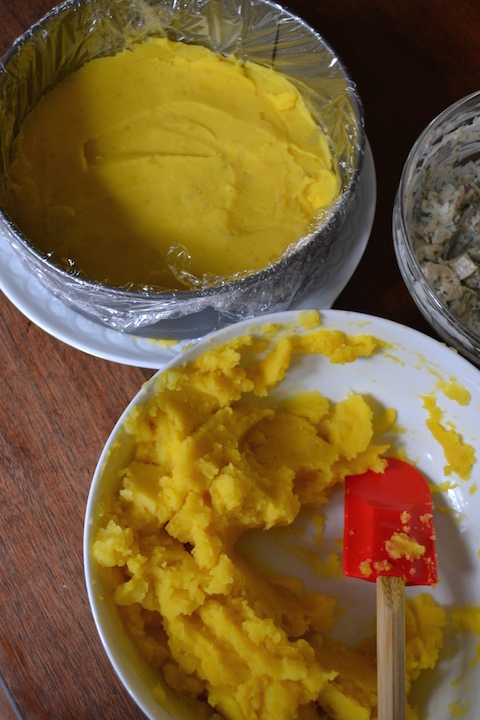 In Peru, it is tradition to use papa amarillas (“yellow potatoes”) in this dish. Here in the United States, Yukon Gold potatoes make good substitutes. Peruvians also sometimes use a papa morado (“purple potato”). Occasionally found in the United States, a layer of purple potatoes in place of one of the layers of Yukon gold potatoes adds an especially beautiful look to the final platter. Order ají amarillo paste online or find it in a well-stocked Latin American market. It’s fruity, spicy flavor is key to the authenticity of this dish. Place the scrubbed potatoes in a large pot and cover with cold, generously salted water. Bring to a boil and cook until the potatoes can be easily pierced with a fork (about 20 minutes). Drain potatoes in a colander and let sit until cool enough to handle. Peel the potatoes and put them in a large bowl. 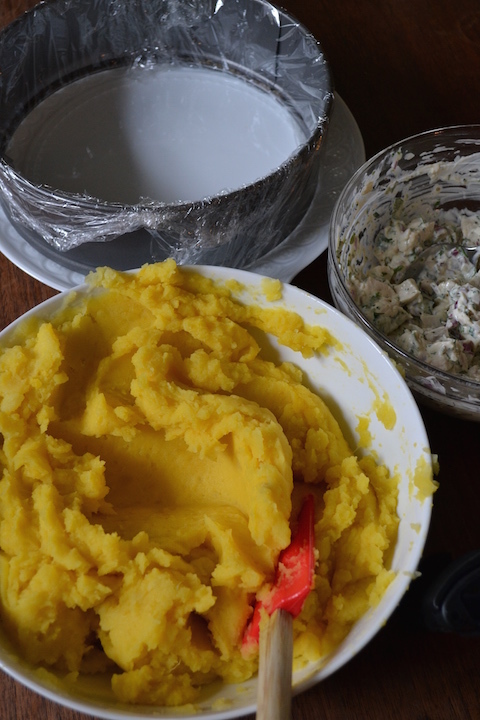 Mash the potatoes until smooth with a potato masher or send them through a potato ricer. Stir in the lime juice, olive oil, and aji Amarillo paste. Season to taste with salt (1 ½ to 2 teaspoons is usually about right). Set aside. In another medium bowl, combine all of the ingredients for the chicken filling. Adjust the seasonings as needed. Cover a small (8- or 9-inch) spring form pan with plastic wrap. Place on a serving dish and spread half the potato mixture on the bottom of the pan. Use a spatula to smooth the surface. Spread the chicken filling over the potatoes and then top with the remaining potato mixture. Smooth the surface with a spatula and cover with plastic wrap. Refrigerate for at least two hours. When ready to serve, carefully remove the springform pan and plastic wrap. 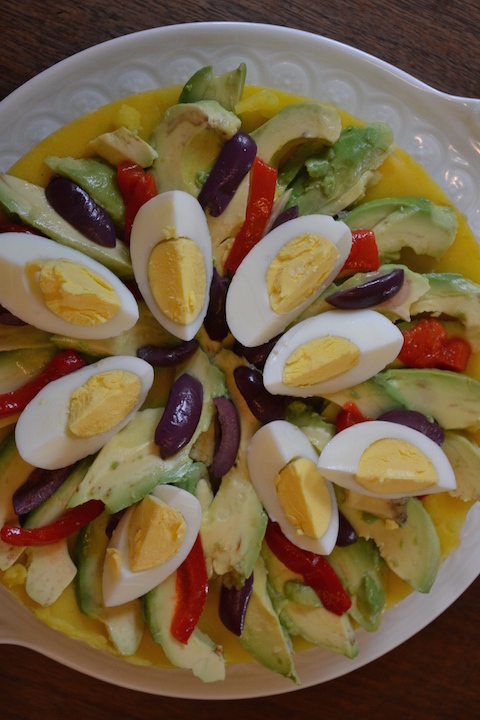 Arrange the avocado slices atop the potato mixer and then decoratively arrange the sliced black olives, quartered eggs, and bell pepper slices. Cut the causa into wedges and serve cold. Wow! I think it’s great that you get to do recipe’s from different parts of the world! Definitely recipe tasting is great! 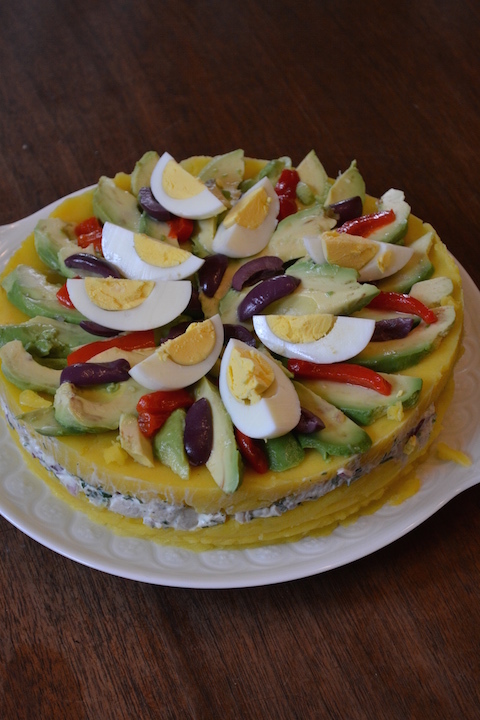 I have friends from Different country’s and learn to make things like Peruvian Causa Rellena. Food is just so delicious! I would love to get some other recipe’s from you.. Hope to get in touch with you.. hermana.martinez.maya@gmail.com Thank you for sharing this! Thanks for the nice feedback and it is quite fun to be able to test recipes from all over the world for WORK! 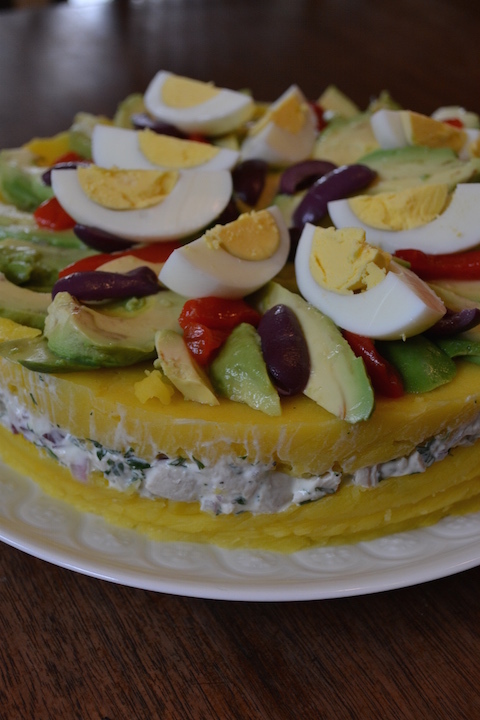 Hope you are inspired to try this Peruvian causa. It’s worth the effort. Love the detail in this presentation too, thank you for sharing! Sent from the kitchen. Please pardon any typos or splatters.